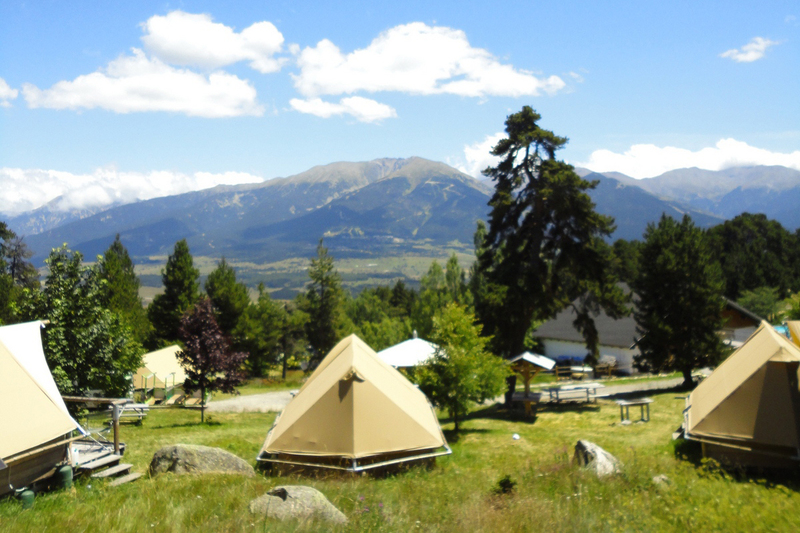 Breathtaking views over the Pyrenees from the swimming pool at Huttopia Font-Romeu. 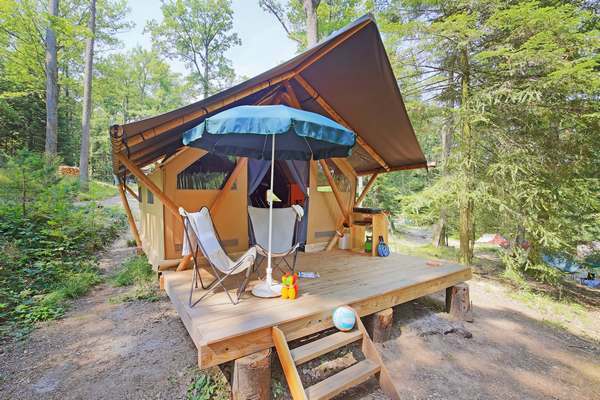 Enjoy the pleasures of a summer holiday in the mountains. The view from the pool! 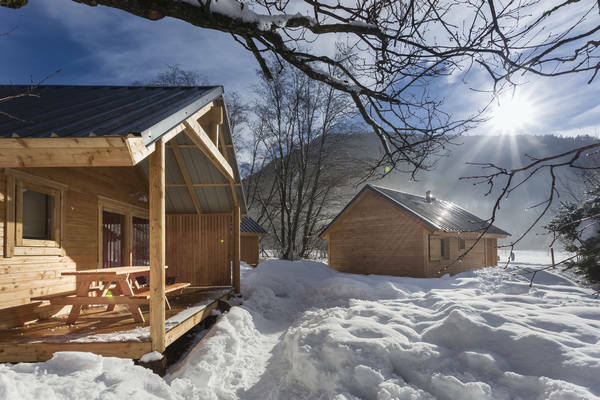 Energise yourself in the Pyrenees at 1800m altitude. 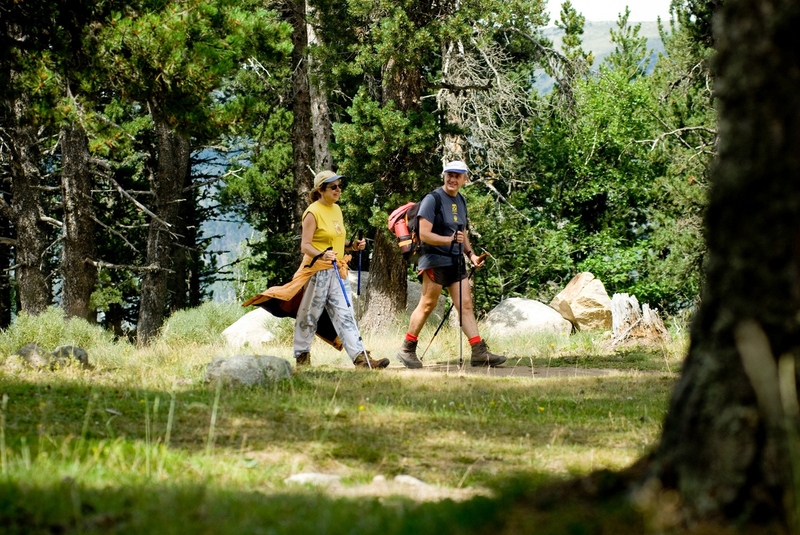 The site is the ideal starting point for a whole range of outdoor sports: hiking, via ferrata, canyoning… an active holiday in the great outdoors! 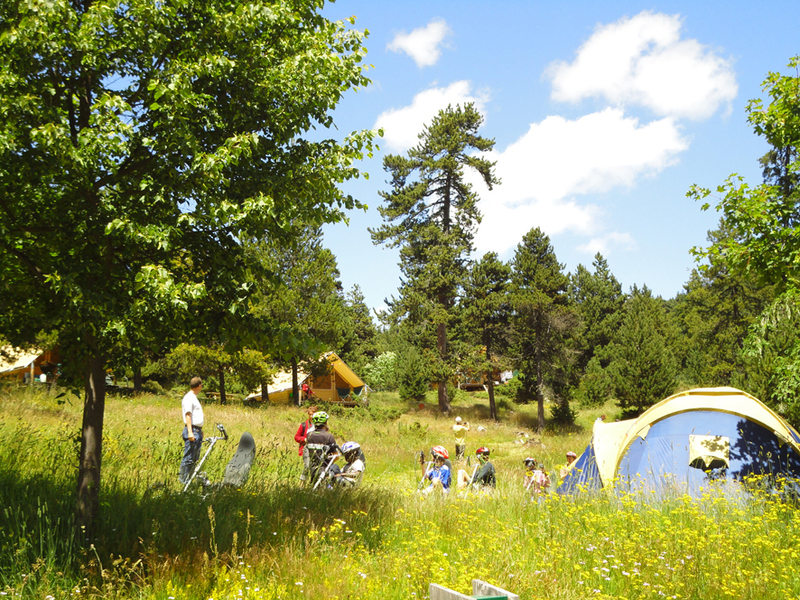 The ideal nature destination for a summer holiday in the mountains! 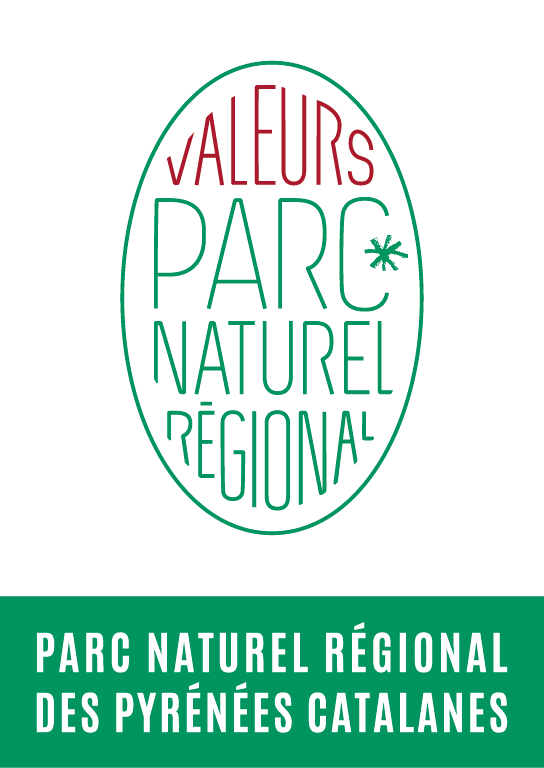 … because we are committed to working alongside the Catalan Pyrenees Regional Nature Park to find a balance between protecting our lush yet fragile rural area and encouraging human activity. 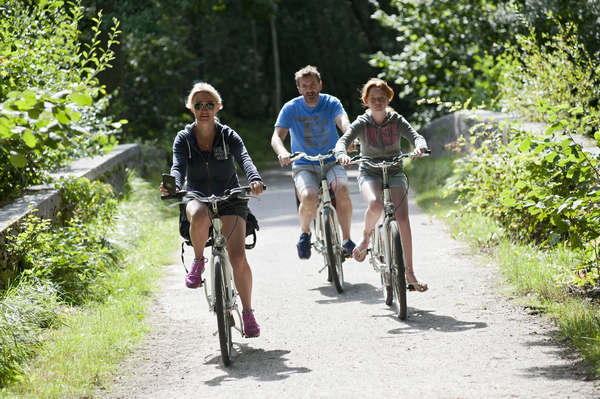 We are contributing to our region’s sustainable development so you can discover what it does best! 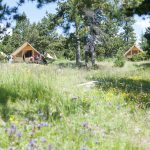 Stay at Huttopia Font-Romeu campsite in a Wood & Canvas tent or a Wood Cabin: nature and the fresh mountain air with all the comforts! 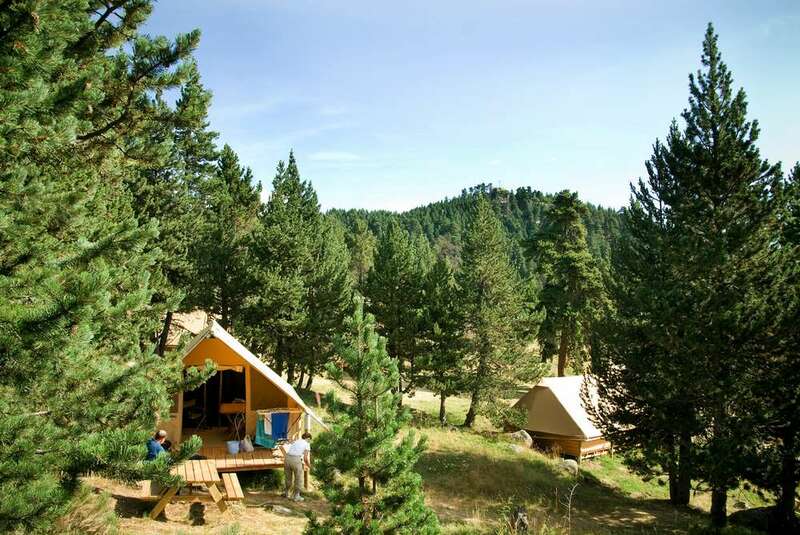 Camp at 1800 m altitude, in an idyllic 7 hectare setting with views of the mountains. 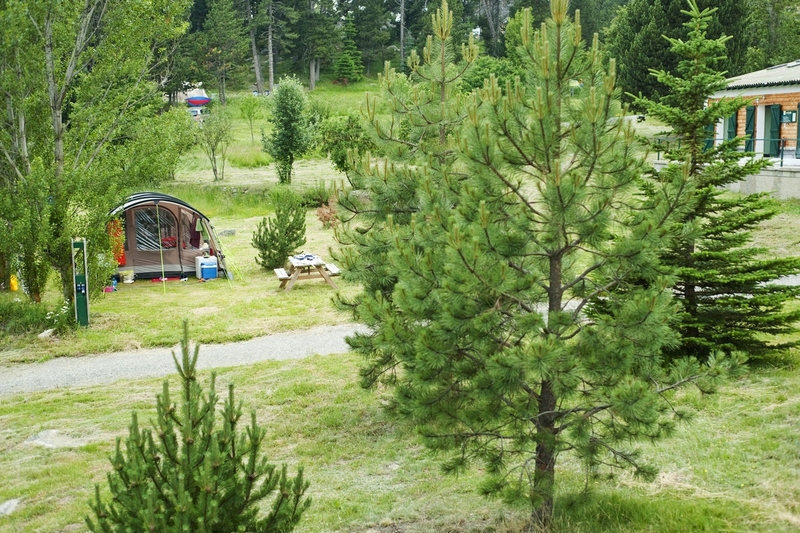 You can set up your tent, caravan, or motorhome on one of the spacious pitches at Huttopia Font-Romeu campsite. 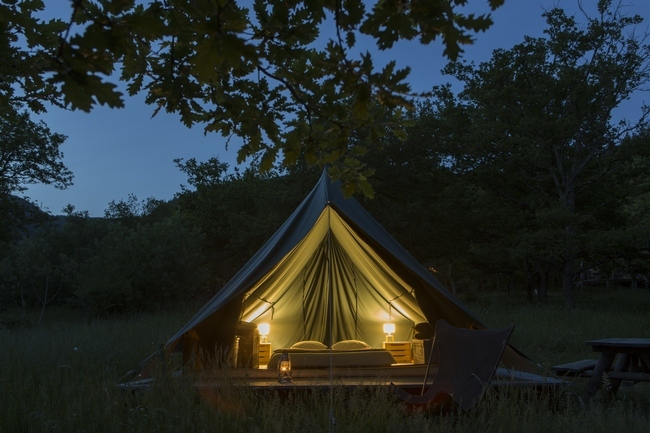 The Catalan stars and the murmur of nature will be your neighbours. Would you like to make a stop over on your journey? 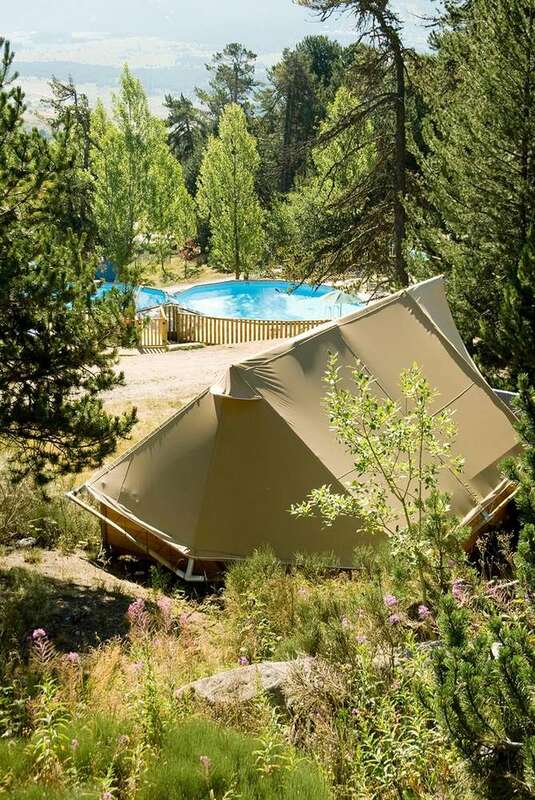 Huttopia Font-Romeu offers a "Hiker / Cyclist" per person rate, which includes a small tent without a vehicle on a Camping pitch. 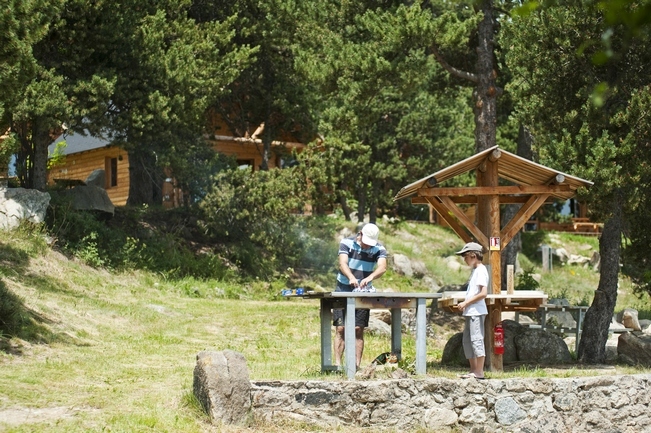 The practical and friendly bivouac areas have picnic tables and sinks for you to wash your dishes. 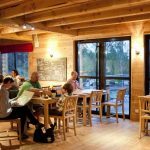 Whether staying on a pitch or in rental accommodation, everyone can make free use of these facilities to get together as a group! 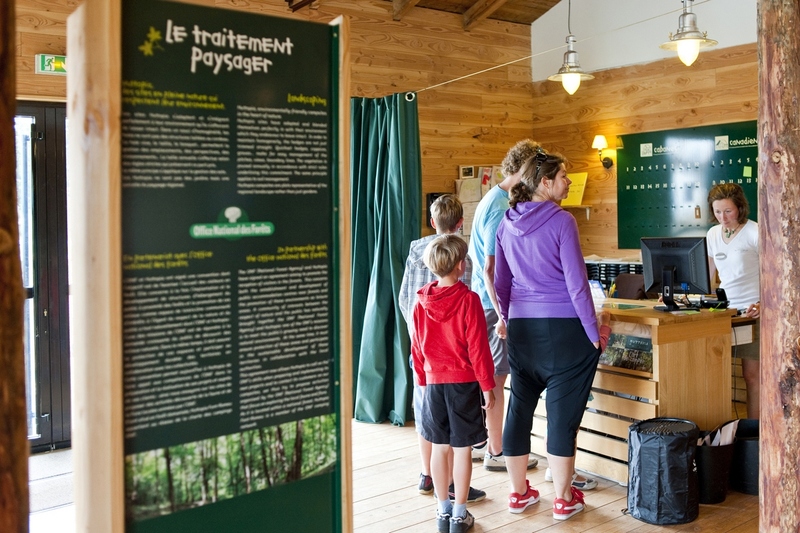 NEW: Enjoy the comfort of brand new washrooms! 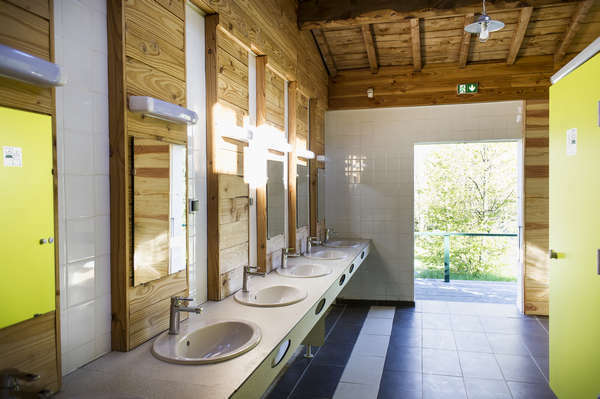 The very comfortable and practical washrooms have large bathroom cubicles with showers and sinks so that families can stay together. 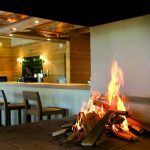 There are also baby areas to make it easier for your little ones to wash.
After a day out exploring the most beautiful hiking trails in the Catalan Pyrenees, you will love relaxing beside the heated swimming pool while the kids let off steam with a game of table tennis. 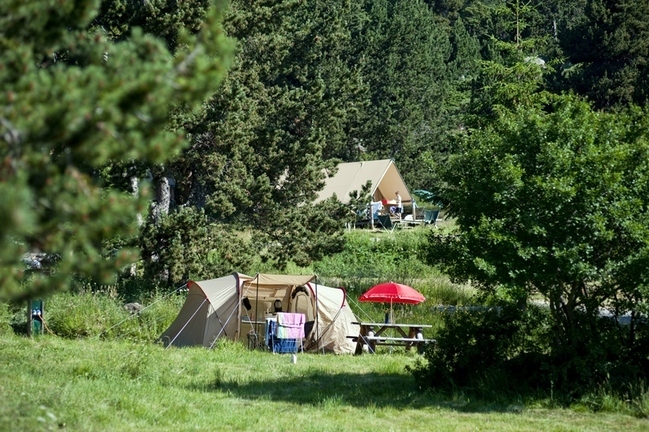 At Huttopia Font Romeu campsite, meals are simple and friendly occasions. 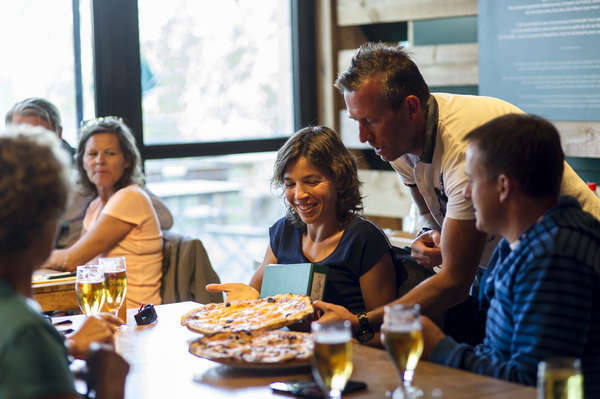 In summer in the evening, get together on the terrace or at the pizza-grill restaurant to enjoy drinks or homemade pizzas with your friends or family. 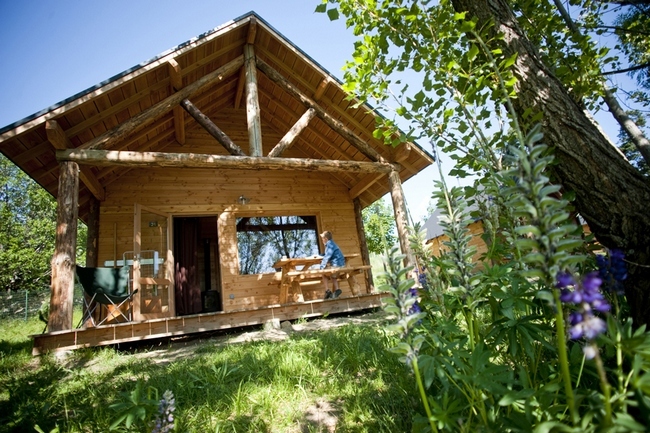 The 100% wooden design gives the central lodge a lovely warm and friendly atmosphere. 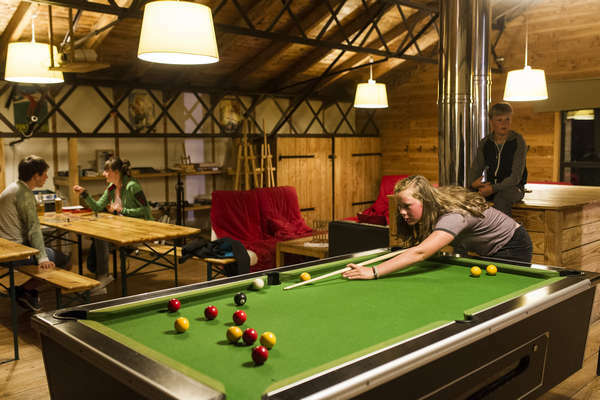 When the evenings are cooler, a fire is lit in the wood stove and you can enjoy the sofas in the lounge area, the book shelves, and the table football. 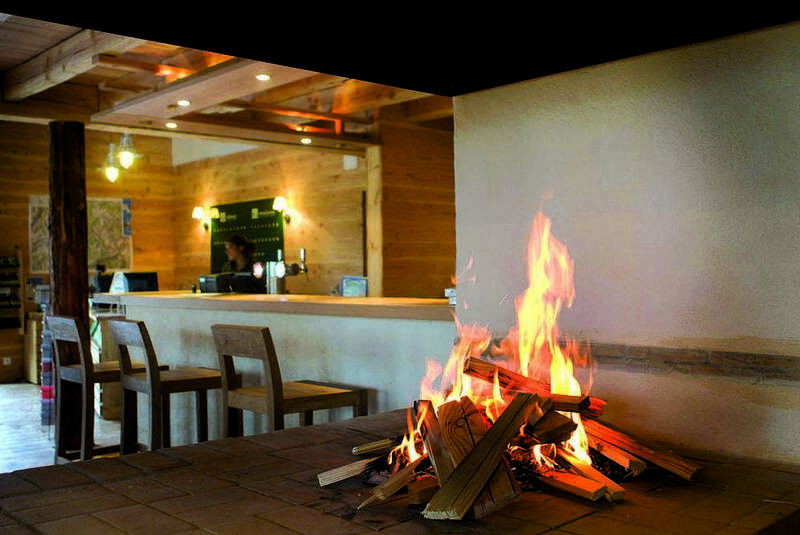 Reception opening from 8 a.m. to 8 p.m. non stop in July / August and from 8 a.m. to 10 p.m. – 4 p.m. to 7 p.m. in low season. 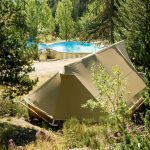 Huttopia Font-Romeu campsite has a lovely swimming area with a pool and paddling pool where your little ones can splash about. 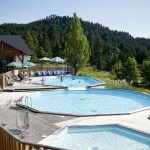 With its beautiful views and sun loungers on the wooden terrace, you will appreciate the pool area when you get back from a hike! Opening from 29/05 to 15/09! 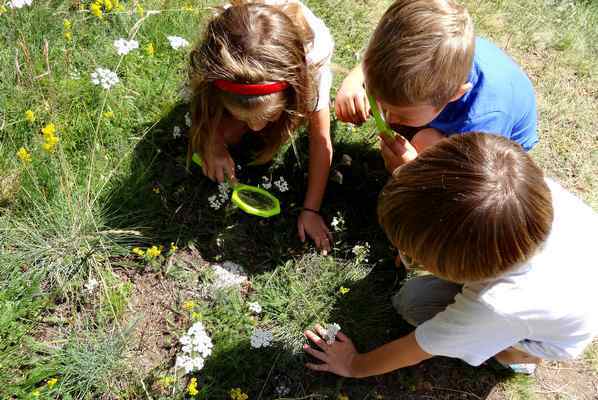 From Mondays to Saturdays, with the many surprises concocted by our activity leaders at the Kids Clubs, mornings are a time for discovery and laughter for 5-11 year olds! 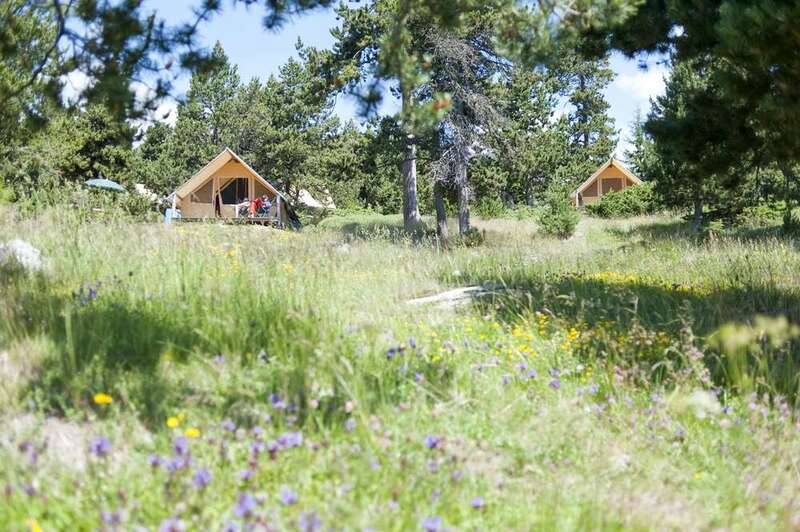 Enjoy your stay in the Pyrenees to the very full at Huttopia Font-Romeu campsite, with our family activity programme, ideal for making the most of the great outdoors and discovering the local flora and fauna. 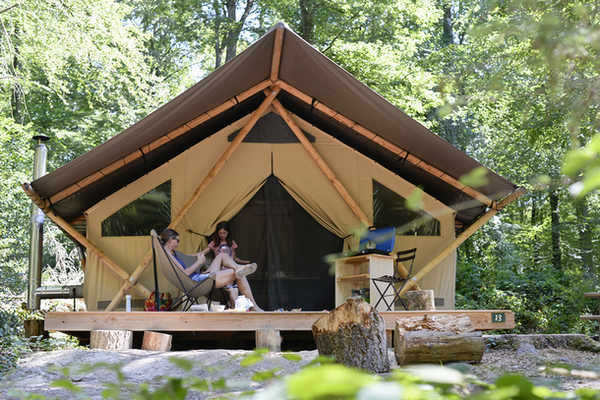 Available from 07/07 to 30/08! 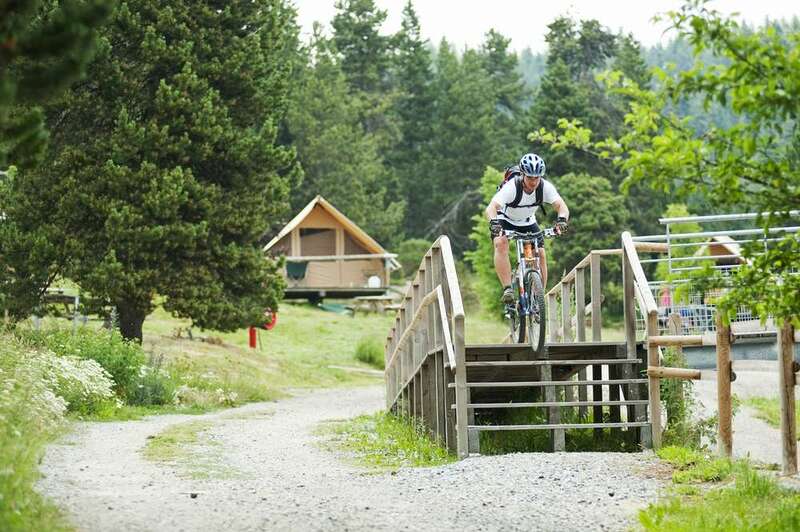 Explore the Pyrénées in true freedom on an electric mountain bike. 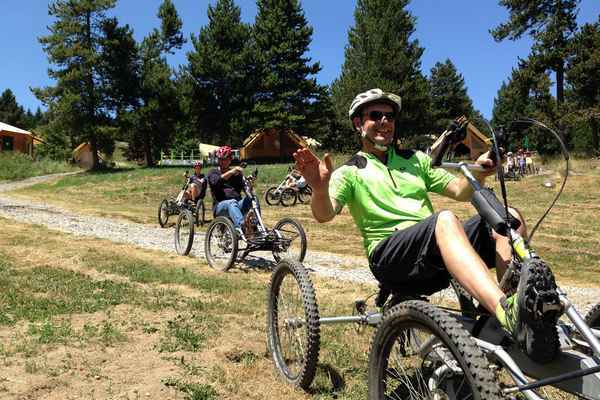 On mud, in sand, uphill… nothing will stop you! Available for hire by the day (from 27/06 to 16/09). 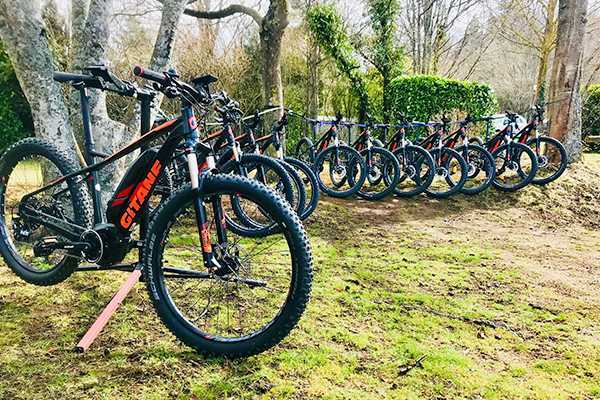 Easier than mountain biking and more environmentally-friendly than quad biking, Hugues will introduce you to this new downhill sport every Monday afternoon! 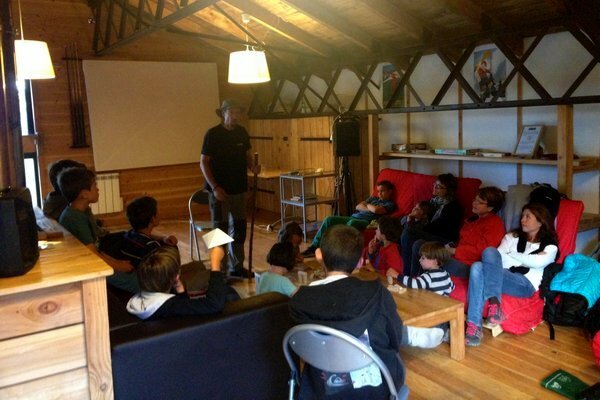 Learn all about the flora and fauna of the western Pyrenees with Philippe, a local mountain guide. 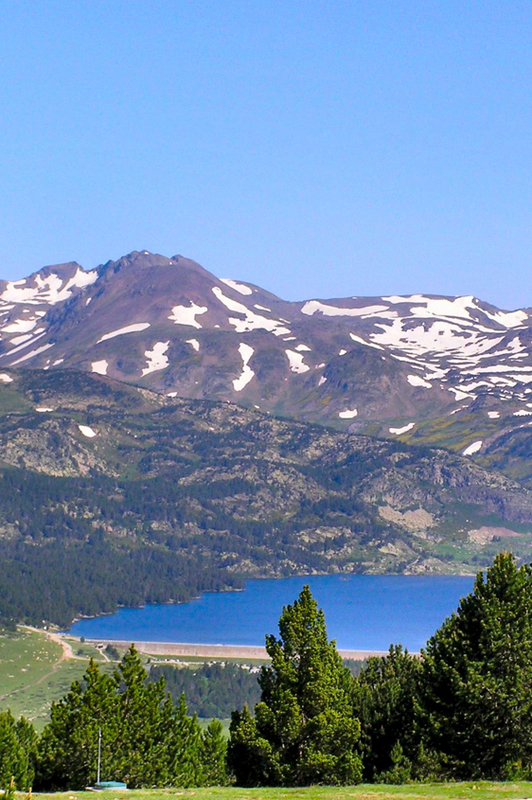 During the day, you can also enjoy walks pulled by musher dogs, tree high-wire courses, pony riding, and archery. 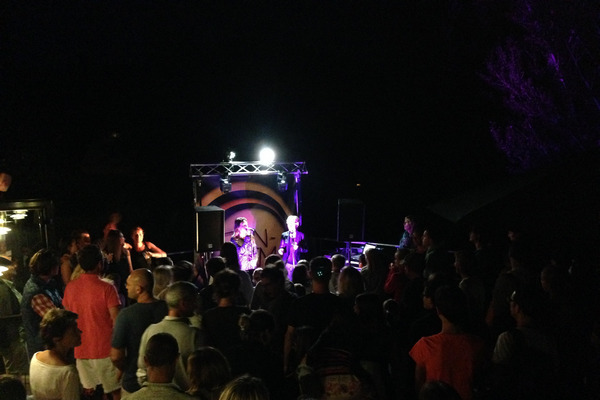 In the evenings, night rallies, giant wooden games, and local tales and legends. 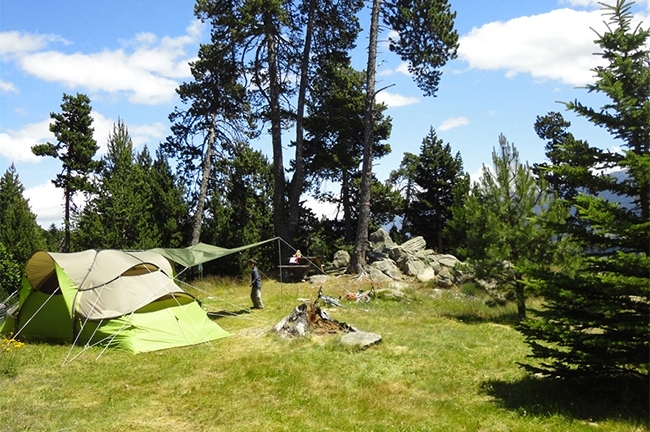 Find out more at the activity forum at Huttopia Font-Romeu! 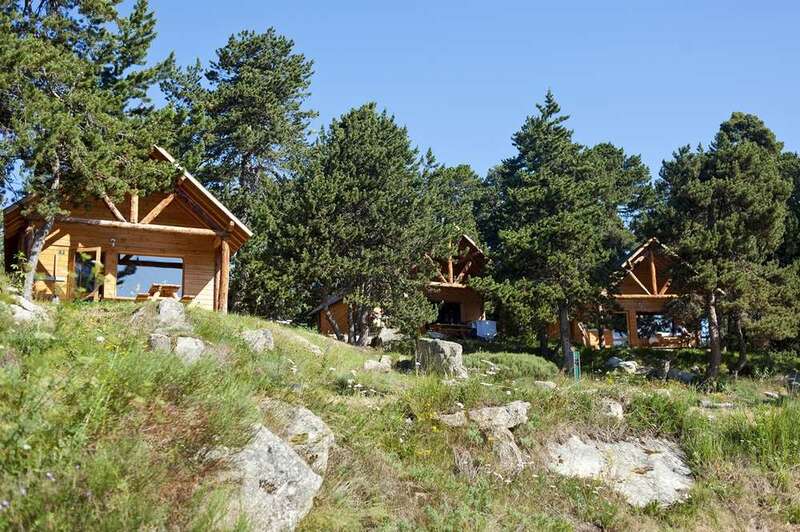 Located in the heart of the Catalan Pyrenees, on the vast plateau of Cerdagne, Font-Romeu offers a breathtaking view of massifs culminating at more than 2900 meters. 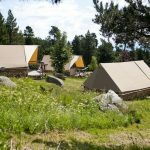 Huttopia Font-Romeu campsite is located just a stone’s throw from the sunniest ski resort in France and is a destination where nature, adventure and discovery abound. 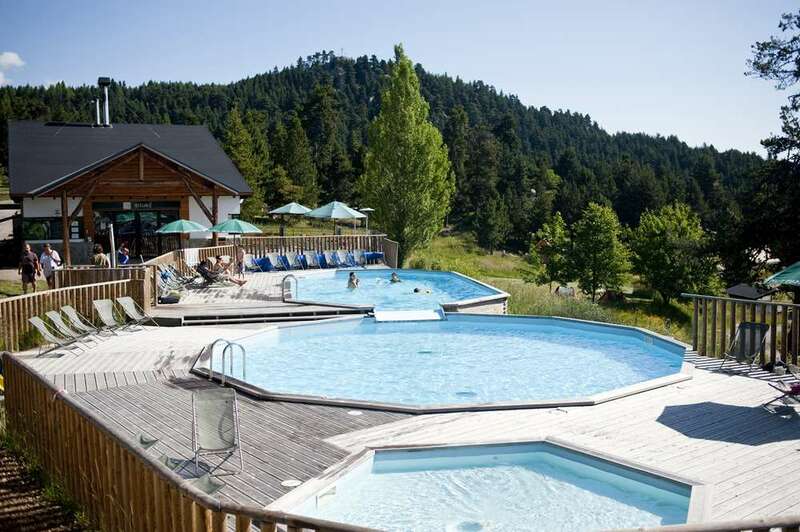 Ideal for relaxing after a day of hiking, there are 3 thermal baths near Font Romeu. 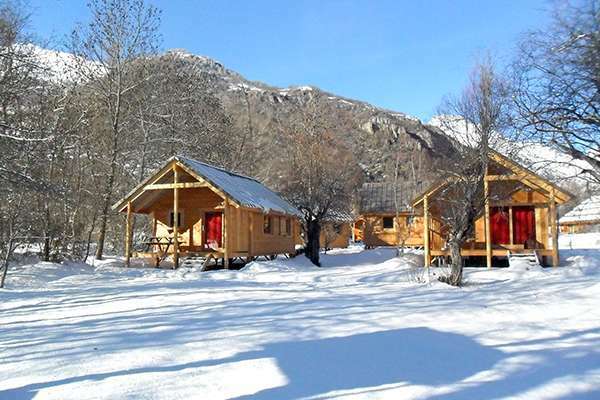 Naturally warm and soft on the skin, the water of the Pyrenees is renowned for its special properties. Take the plunge! 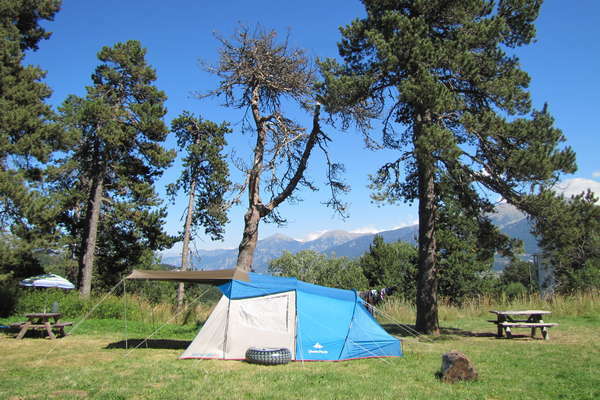 Extending over 138,000 hectares of the Cerdagne, Capcir and Haut-Conflent, the park incorporates Mount Canigou, Carlit peak, and Puigmal. 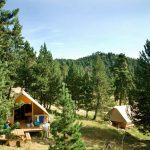 Lac des Bouillouses is also a natural classified site where you practice fly fishing and is also the starting point for many hiking trails. 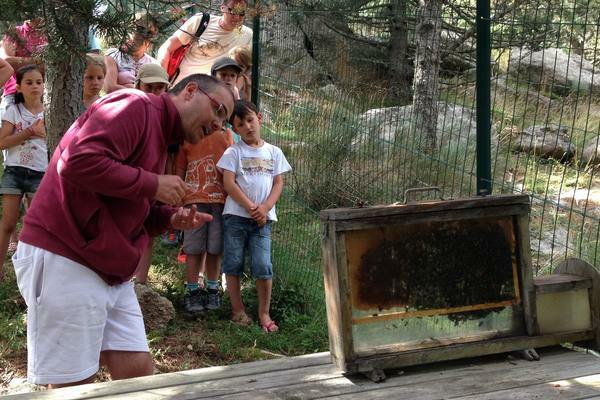 At the foot of Mount Canigou, Casteil animal park is home to wolves, mouflon, bears, and various species of birds.  Visit forts, churches, and citadels, reflections of the Roman Art found throughout the region. 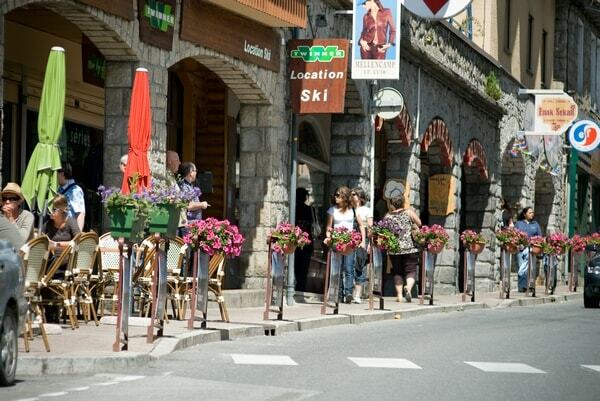 Mont-Louis, the highest fortified town in France is also worth a visit. 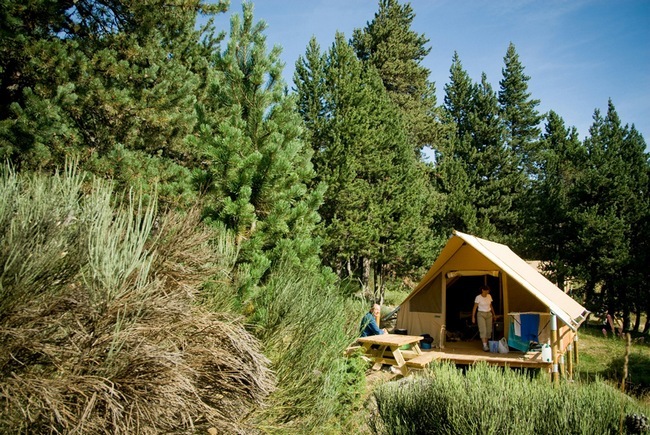 Our top pick for a relaxing day? Villefranche de Conflent, classified as one of the most beautiful villages in France, which owes its originality to its Vauban fortifications. 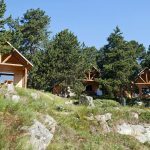 A calm and peaceful stay on the slopes of the Pyranees with views to die for in every direction. 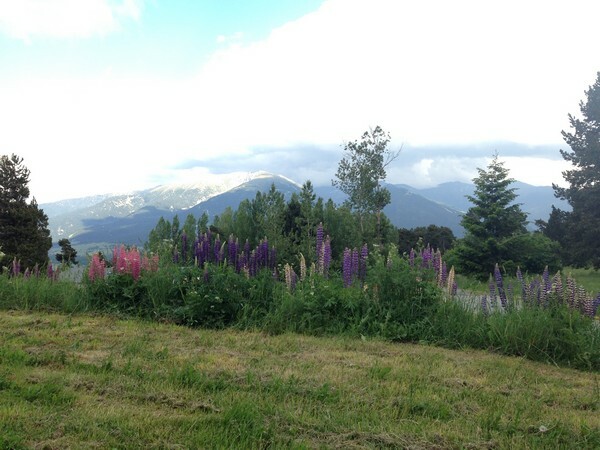 Well maintained facilities; lots of space between the pitches and close enough to Font Romeu to walk in - best of both worlds. 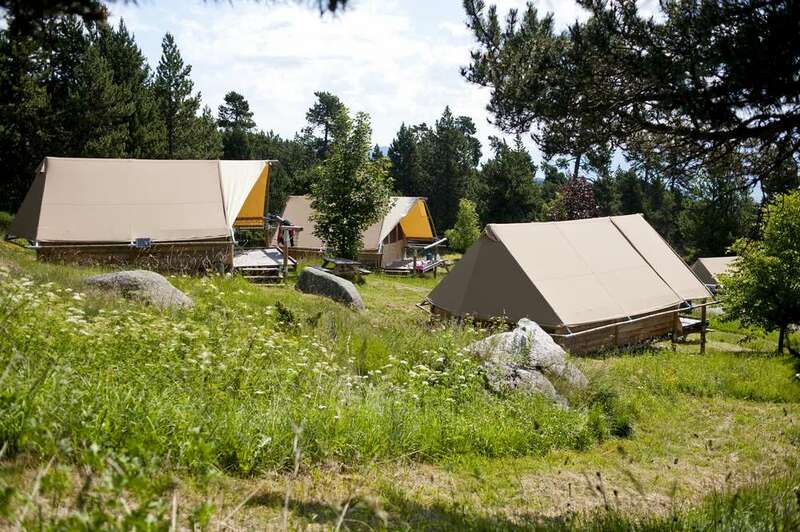 En flot beliggende campingplads med pæne og rene faciliteter. 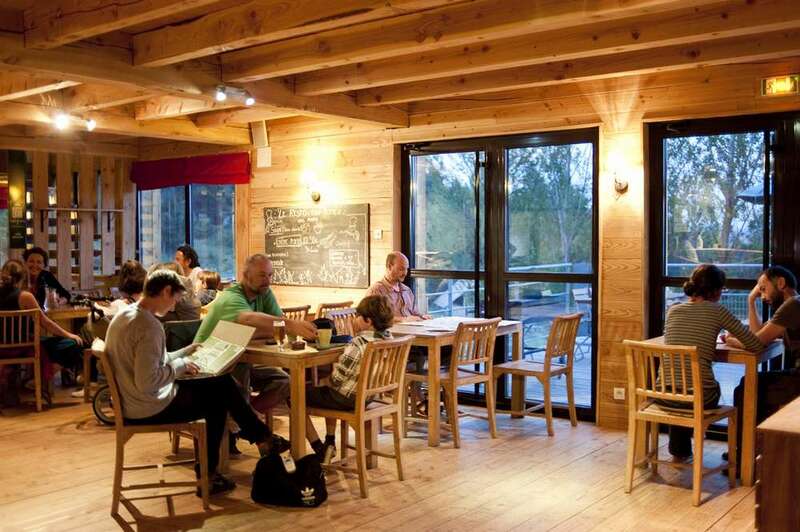 Jorden er blød og nem at banke pløkker i. Eneste store minus er, at der intet varmt vand er i hanerne til opvask og et bad kun lige akkurat bliver lunkent nok til at man Ikke fryser. Toiletterne er gode og pænt rengjorte. Ønskes strøm, skal man huske en lidt lang forlængerledning da der kan være langt til elstanderen. En fin plads i den lidt dyre ende. Husk i øvrigt myggespray og lidt varmt tøj da nattemperaturen i denne højde ofte er ret lav.